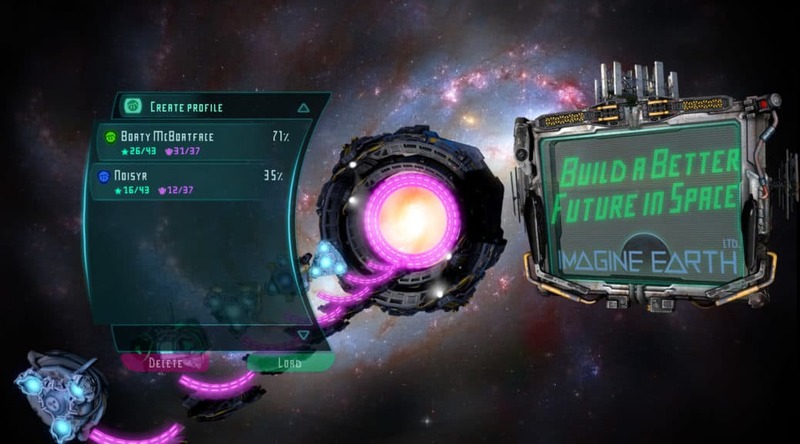 In the first update for Imagine Earth in March you’ll find many optimizations for UI and AI that lay ground for innovative new game play features consider the next update to revolutionize core game play at several odds and ends. The research menu has a new optional viewing mode where all details are presented directly on screen instead of as tool-tips. For now the compact view still stays the default view, so you have a perfect overview for all your research processes. We also optimized the filters in the research menu. 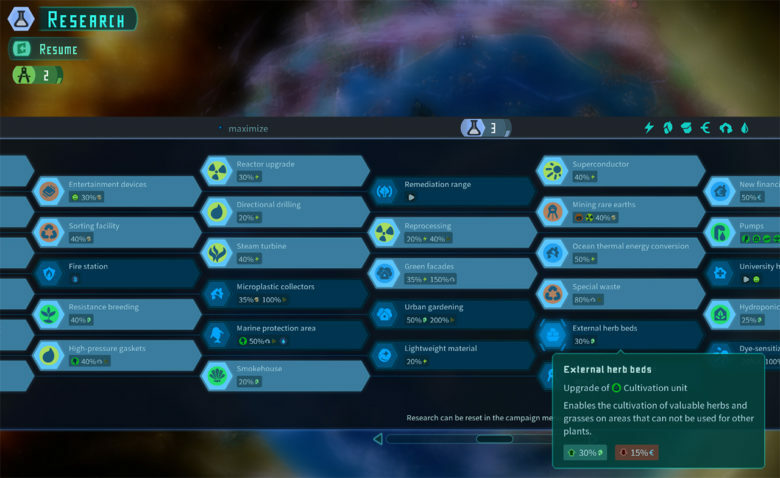 You can highlight research options according to what their primary effect is. That makes it easy to adjust your research strategy to suit your specific needs. The building descriptions in the build menu now also contain all upgrades of the building and their potential pros and cons. 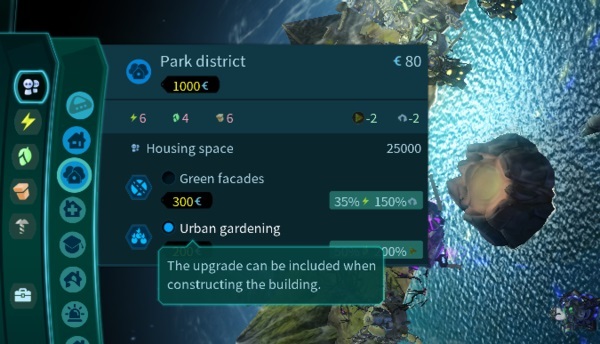 Upgrades that have already been researched can be activated here to be automatically build together with the building. We made the visualization of competitors more compact and consistent to the rest of the user interface. 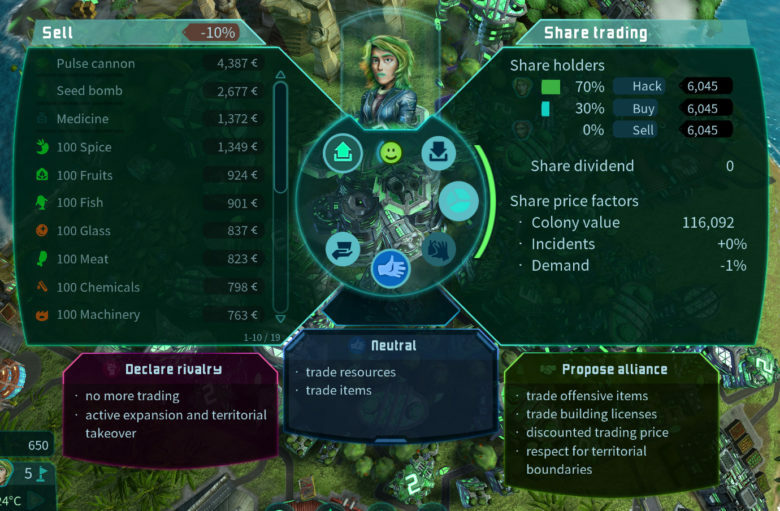 Instant intuitive visibility for the ranking, diplomatic status and victory points. More over you see which incidents or catastrophes are impacting their colonies and also the resulting share price drops. We reworked the competition ratings table. 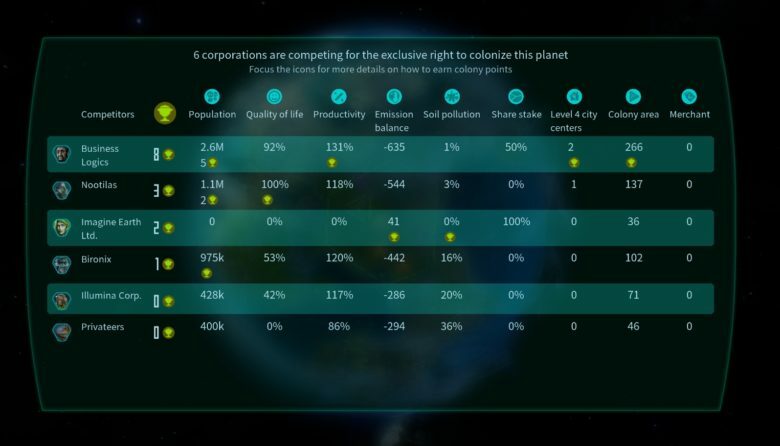 The x-axis now has the different types of colony points needed to win the competition. We added more captions and explanation texts to clarify all aspects. Factions do now have individual agendas that add character and individual tactics to the 8 different corporations you can play in competition and freeplay mode. Aggressive: Aggressive diplomatic sentiment. Sabotages other colonies. Sustainable: Preserves the environment and prefers buildings with low emissions. 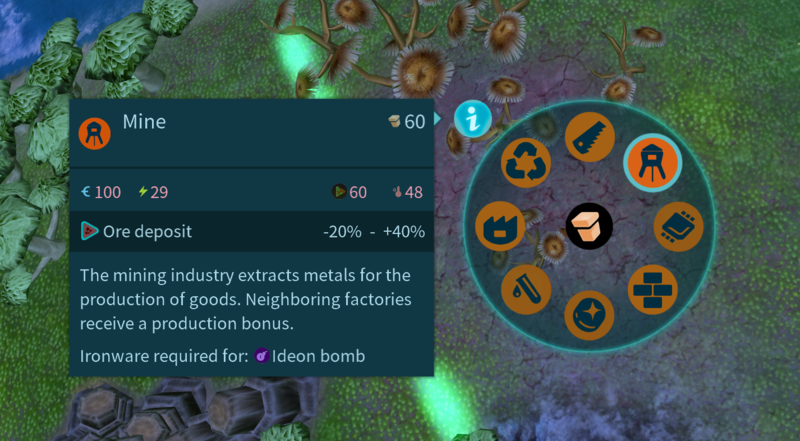 Exploitative: Tries to get as many fossil and rare resources as possible. Does not care about environmental impacts. Expansive: Trying to own as much territory as possible. Does not like it when someone takes over territory. Trader: Focuses on trade. Likes to sell resources and items. Gaian: Tries to get as many temples as possible and generate Gaia. Oceanist: Prefers to build the colony on the coast and the sea. Scientist: Researches as many technologies as possible. A decent foam line at the coast makes it easier to identify the exact sea level and whether fields are land, coast or ocean. This is an addition to the waves the are rolling in and breaking. There are several options in the build menu that help to visualize certain states and objects in the world. For example it can colorize buildings by their type to provide a better overview. You can now sell incomplete packages of rare resource to free up space in the warehouses. Workshop menu got a face lift. If you loose competition you won’t get spammed by the professor commenting on that anymore . Build menu: you can now have a certain category activated that stays open also when you hover another for short operations. 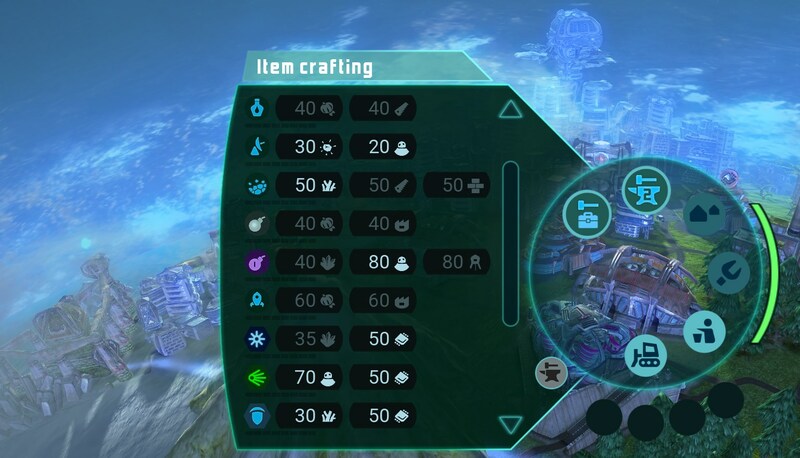 So you can keep your eye on your inventory or the forces you have ready. 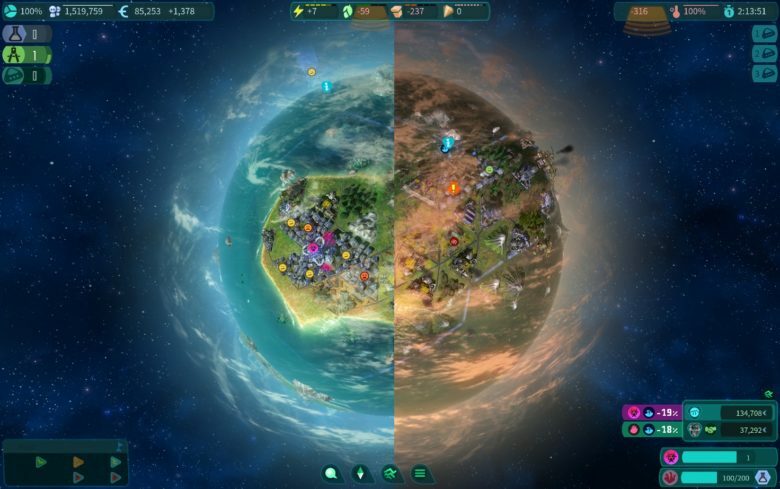 AI in sandbox is no longer saved and transferred into created planets. 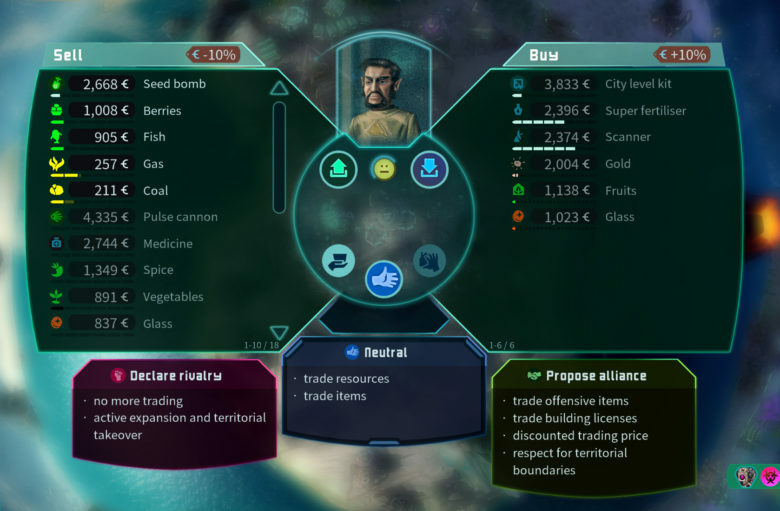 Bora: AI allies may no longer build their second colony next to the great pyramids to prevent the mission plot from getting stuck. 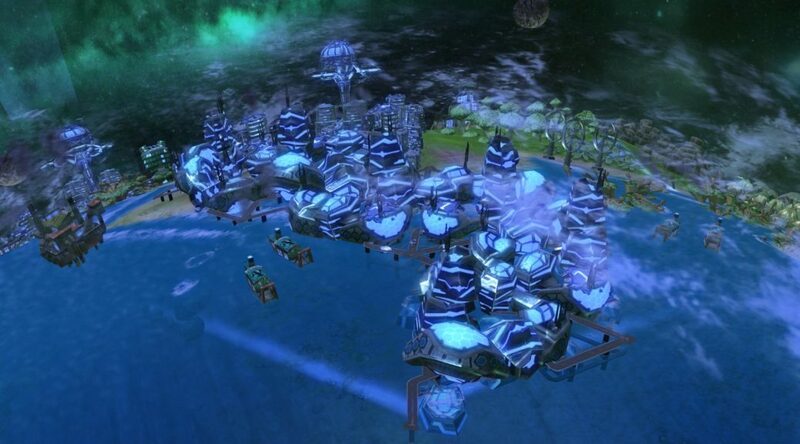 The ocean citadel is a powerful construction of the Nootilas, it can convert Gaian energy into force fields which influence sea and weather conditions. It is to be found on the open sea of course. 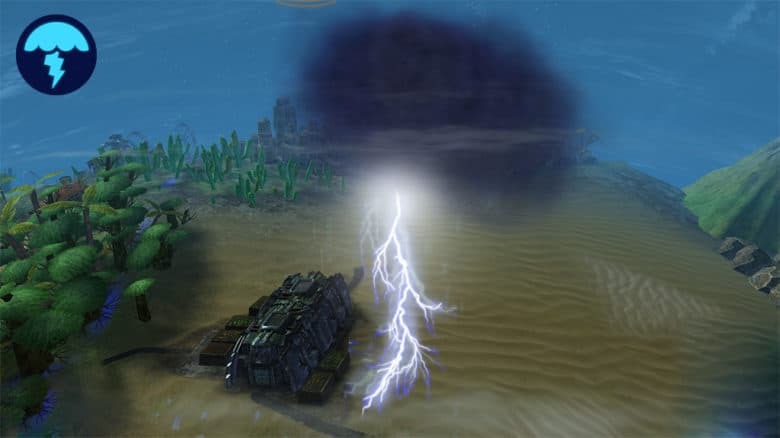 A power of the ocean citadel provokes a thunderstorm that moves across the planet in wind direction. The storm can cause wildfires and incidents in production facilities. Thunderstorms are also natural catastrophes whose occurrence becomes more likely with increasing global warming. This power of the ocean citadel generates a gaian force field that vitalises the flora on the seabed and allows sea plants and occasionally corals to grow. This is helpful to re-balance the carbon emission balance on the planet. 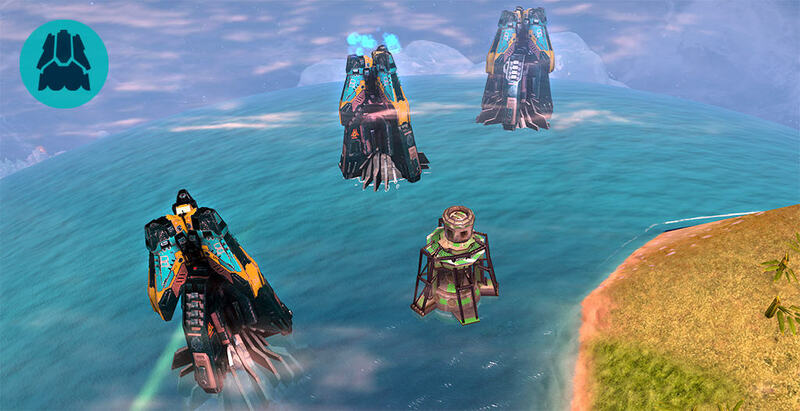 This Gaian force field of the ocean citadel lowers the tectonic continental plates – entire regions sink into the sea. Keep the mouse button pressed to apply the power. Land reclamation works the same way from now on. 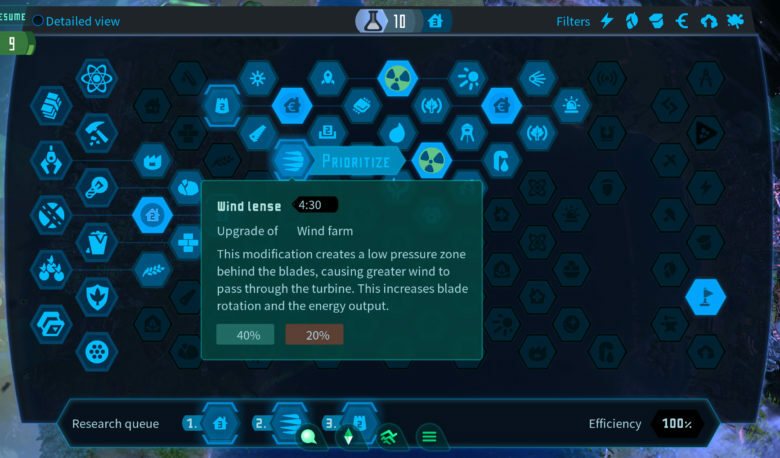 You can now reuse forces and items by holding the shift key as long as you have more items of the same kind or enough gaian energy left in the according power constructs. Due to the importance of this feature we have represented Global Warming more prominently in the Interface. 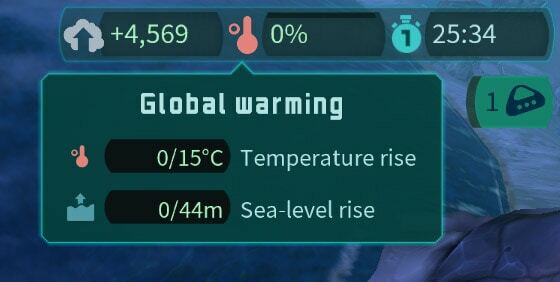 You get a permanent display and icon for the emission balance and the global warming in percentage. And there is a global value of sea-level and temperature rise. 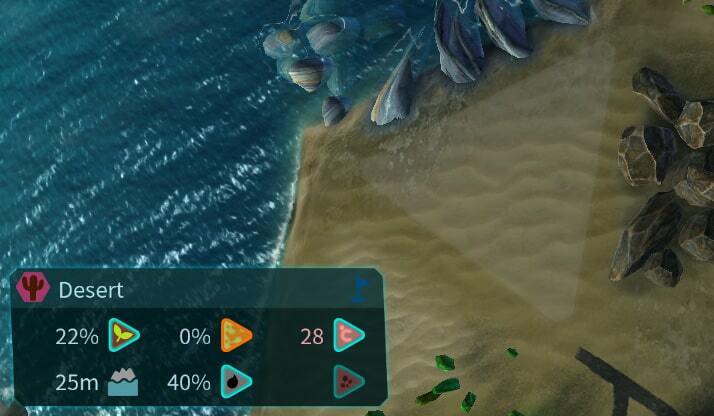 The population counter has moved to the left of the UI also because it is not global. For better information it displays how high a certain piece of land is above the sea-level which is of particular interest in case of global warming. Will it be flooded by the melting polar caps? We deactivated the quarantine of the planet in case of climate collapse which ended game way too early. 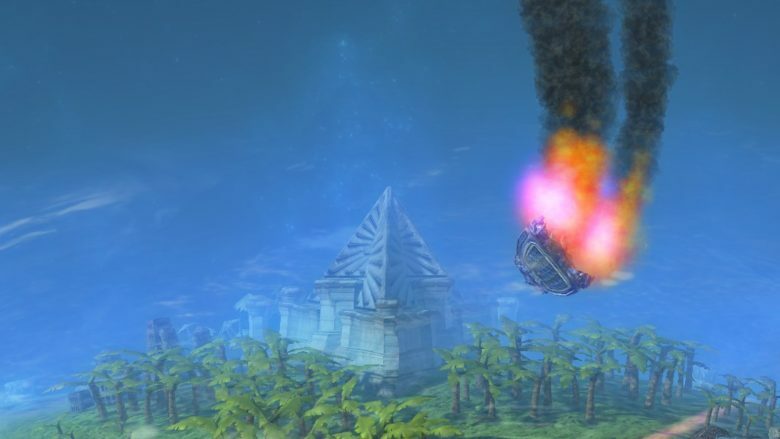 You can now live on a ravaged planet with maximum climate chaos and all the catastrophes arising with it and still try to make your living or win a competitive round somehow. You can activate this quarantine when starting a new game to stop a round when it gets almost hopeless. Also we changed the visualization of high global warming which was a bit over the top with yellow coloring of the oceans and the atmosphere. Again we had to rework many aspects of the first three missions of Tuto, Joma and Lorian to improve the experience of the campaign, make it more accessible to new players and adjust them to the lately added features. a bar displays the goals for achieving new research, tech licenses and landing permits as such. Of course we’d like to take the opportunity to wish you all pleasant holidays and a happy new year in advance! 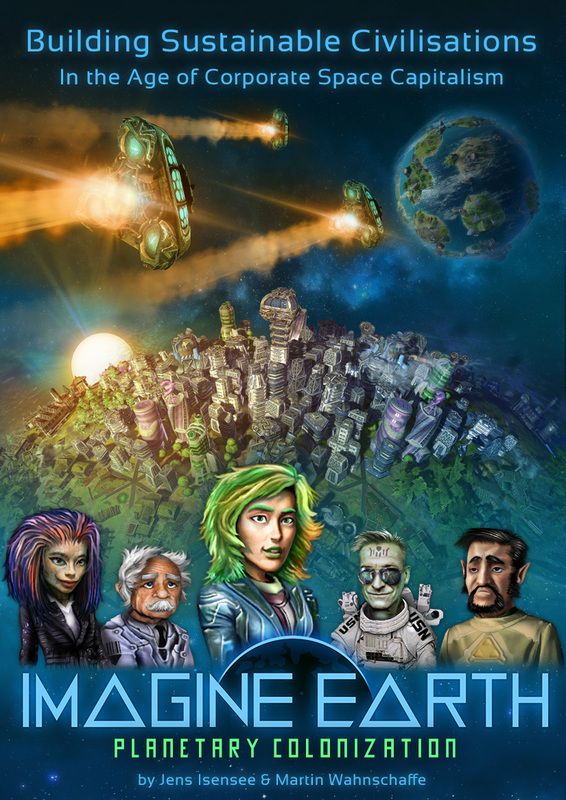 We plan to celebrate the final release of Imagine Earth together in mid 2019! 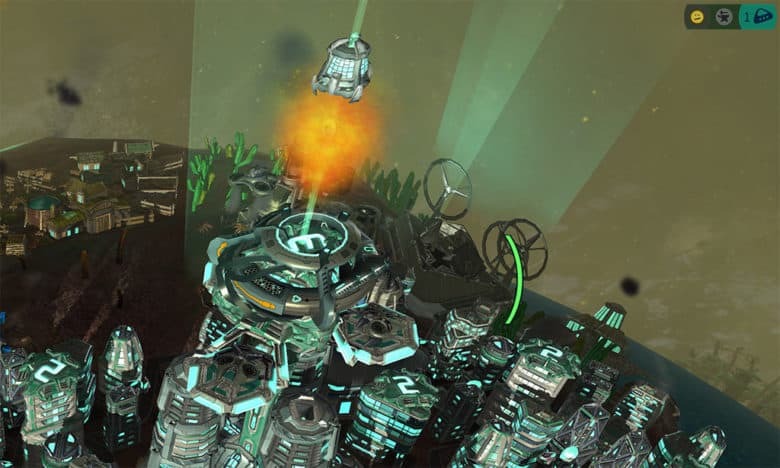 The Sabotage item hacks supply buildings within a small radius and sets them into the state of malfunction in which they stop production and are constantly damaged until the building is destroyed or the malfunction is fixed. 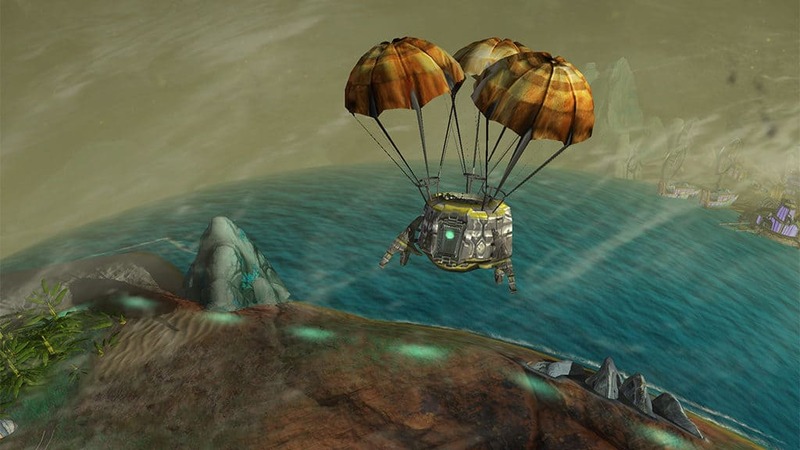 Supply capsules contain items, resources and building construction kits. 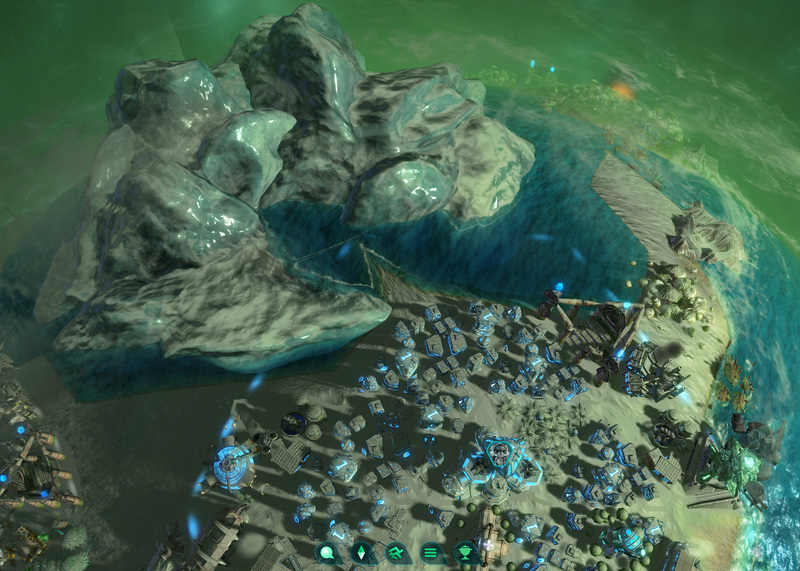 The colony that claims the field it landed on can take the cargo. The capsule will then disassemble automatically. 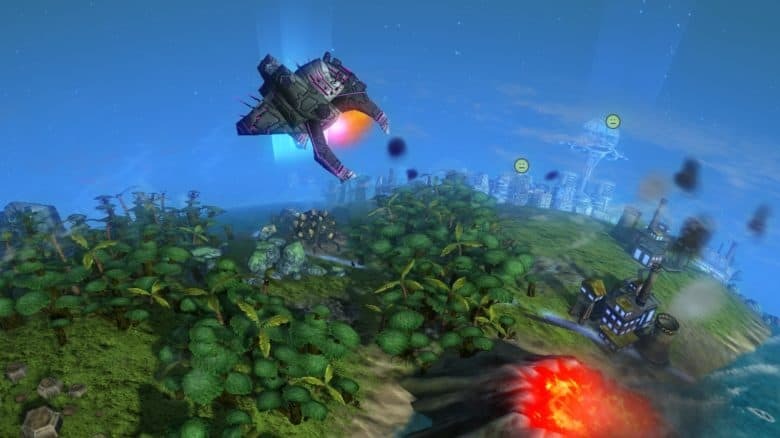 They will land randomly on the planet throughout gameplay. New orbital lifts show you when colonists are coming or leaving your colony. 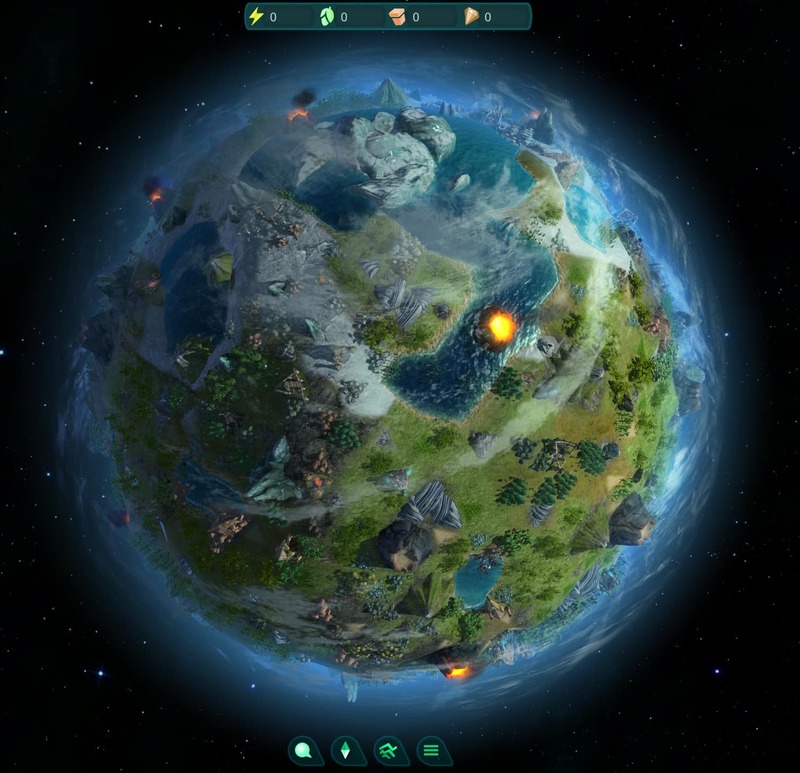 This animation makes the colony more lively and visualizes where the colonists come from and where they disappear to when the quality of life is too low. In the campaign galaxy you will now see a completion panel that shows your overall campaign progress. More important the colony ratings on all planets are wrapped up in a company rating that is compared in a global ranking. 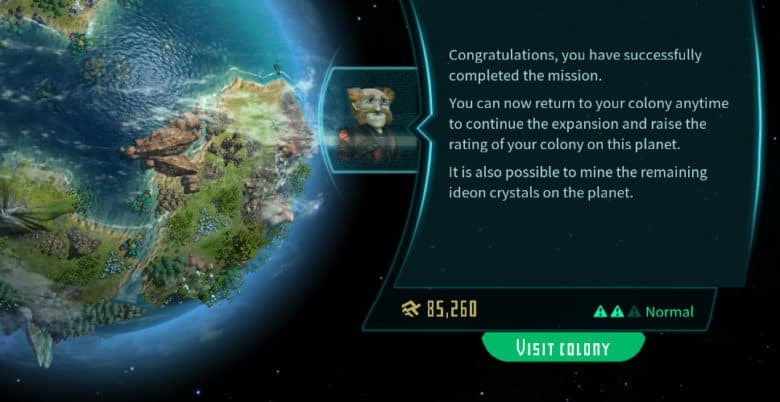 You can now revisit colonies after finishing the mission to find the remaining ideon crystals and to raise your colony rating by expanding your colony. Campaign research and unlocked buildings are permanent. So you can use the technology you gathered in later missions to advance the cities when your return to earlier colonized planets. Other corporations now have three shared diplomatic statuses: rivalry, neutral or alliance. They define if other factions trade with you and if there will be discounts. 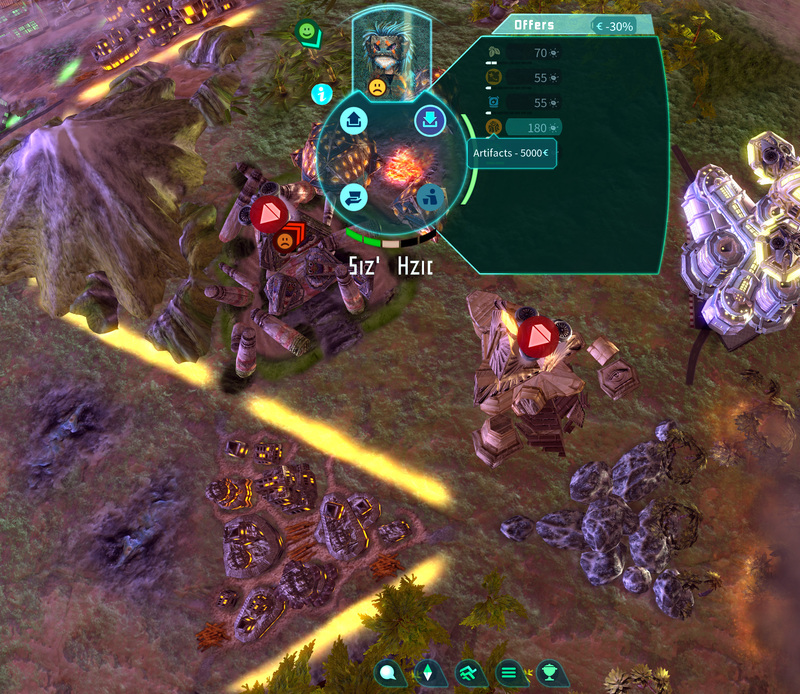 It also influences AI behavior: An alliance partner will respect your territory – a rival will actively grab your land. 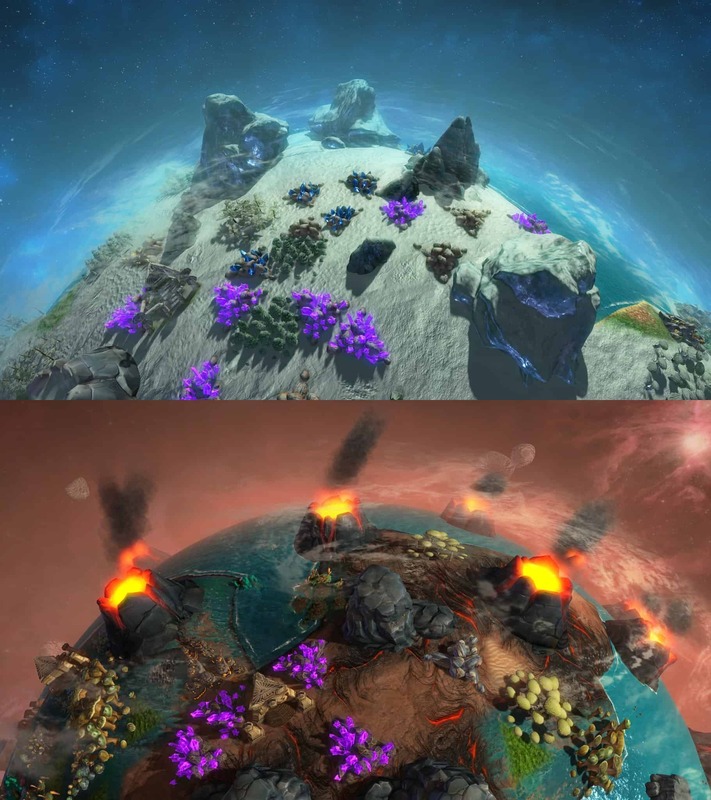 Dear Colony Managers, in this update we increase the visual and gameplay diversity of our planets with the themes Jungle, Terran, Swamp, Barren, Volcanic and Frozen. Also we dedicated a lot of our time into making the Tuto and Joma mission a better experience. Read on to find out what else has changed. 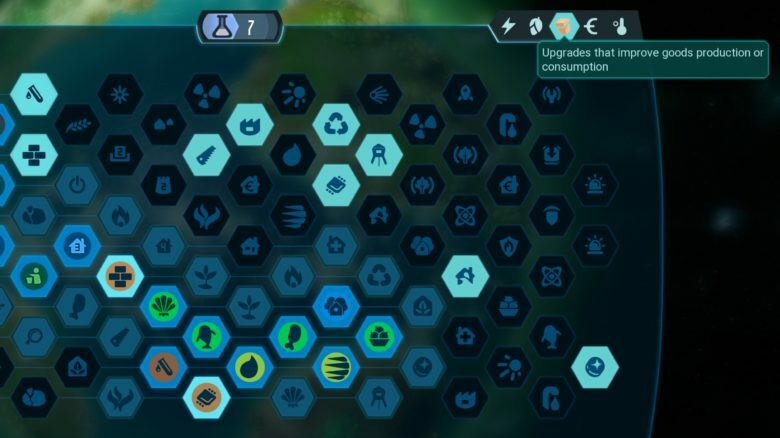 Asteroids now can contain all types of rare resources. They look different and when you decide to throw one of these asteroids against an opponent you might accidentally send him a big present full of ideon or lithium. Scanners are having an increased scan radius and an increased value in gameplay. You will now have to scan all rocks to find out if there’s any gold, titanium, lithium or ideon hidden in them. 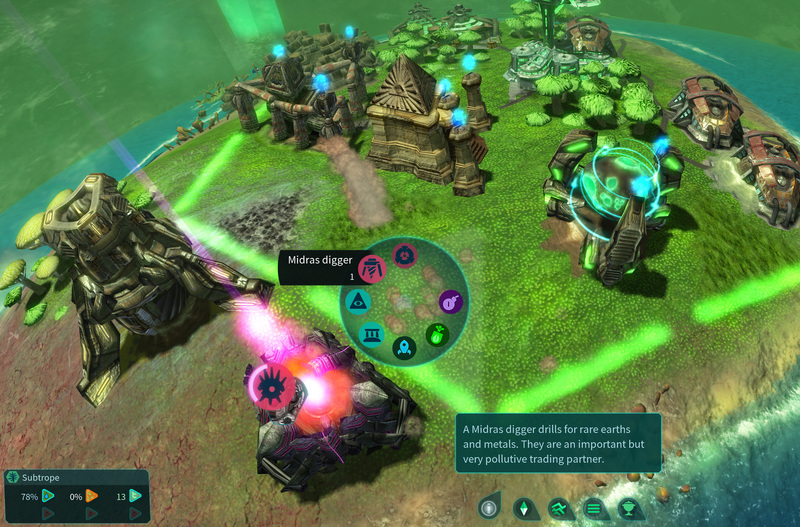 Rare resources are automatically detected when you take over the field into your build radius. 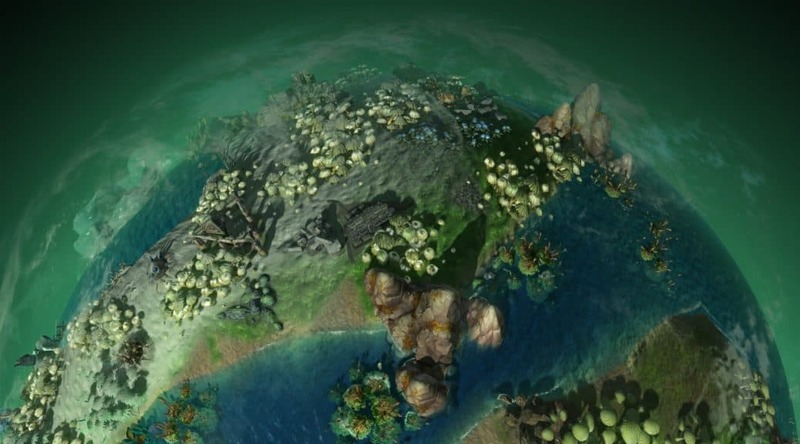 The amount of rare resources on all planets has been raised in general. You can now access all the forces you have loaded in temples right from the build ring. 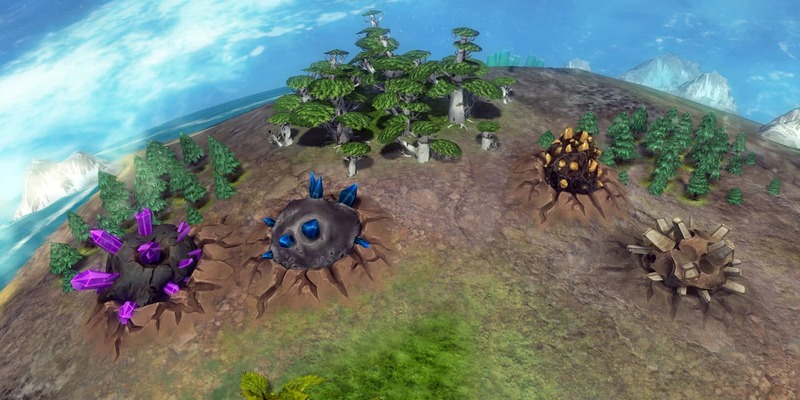 Therefor we have thrown the forest ring out of the ring menu because you can only build forests with seed bombs from now on and the different types of forest weren’t relevant enough for gameplay to take up an own slot in the main build menu. Drones no prioritize open tasks. Dealing with fires is most important, followed by repairing highly damaged buildings. After that they will deal with new buildings and other things. They only return to the city center when they need a package to build something. 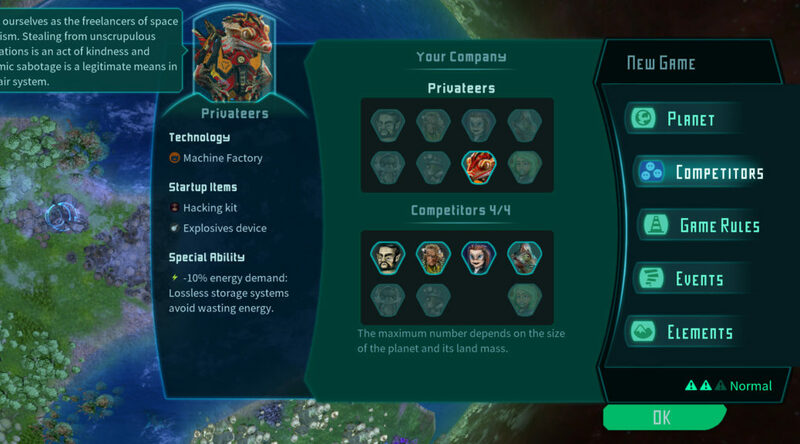 We have set up six general presets or themes for planets, so you can choose quickly under which conditions you want to play a competition round or freeplay. 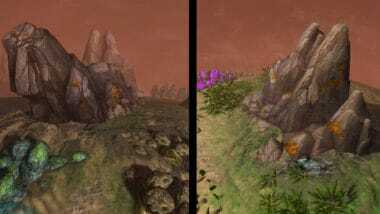 Choices are Terran conditions, Frozen World, Swamp, Barren, Jungle or Volcanic World. In addition there are new mountain models on many of our planets. We reworked the first three missions, so that you can play more straight through without being interrupted by dialogs and story suddenly popping up. 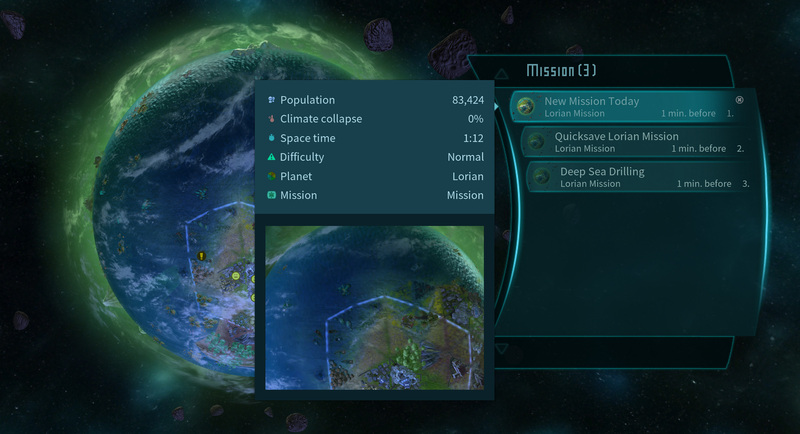 More story elements are now clickable in form of info and mission icons. So you can start cut-scene when you are ready. On the other hand we made them auto started when nothing was happening story-wise for some time so you don’t miss important story elements. To make the factions more personal we have individual victory messages when others win in competition mode. 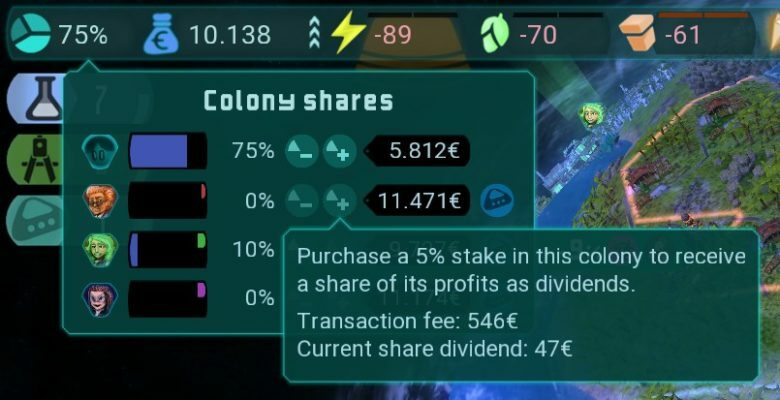 When you take over an opponents city by buying up his shares you will no longer have to pay an extra money fee for the takeover as you paid for the shares already. Rebuilding a city center with a new landing permit is now free of charge because generally you have paid for the landing permit itself or earned it otherwise. You will be getting more dividend payments out of shares you hold of other corporations to make the feature more relevant. The emission levy costs for air pollution have been reduced as it was so high that it ate up almost all of the companies profit. These nasty creatures land a strange kind of unknown flying object right over your warehouse to plunder it with their tractor beam. Simultaneously they start firing their board cannon to vandalize your base. These pirates are not only a threat that randomly happens. You can also craft a landing control to send them upon one of your opponents. Sweet addition: You get half of what their ship can steal. We are proudly presenting individual colony landing ships for all eight corporations. 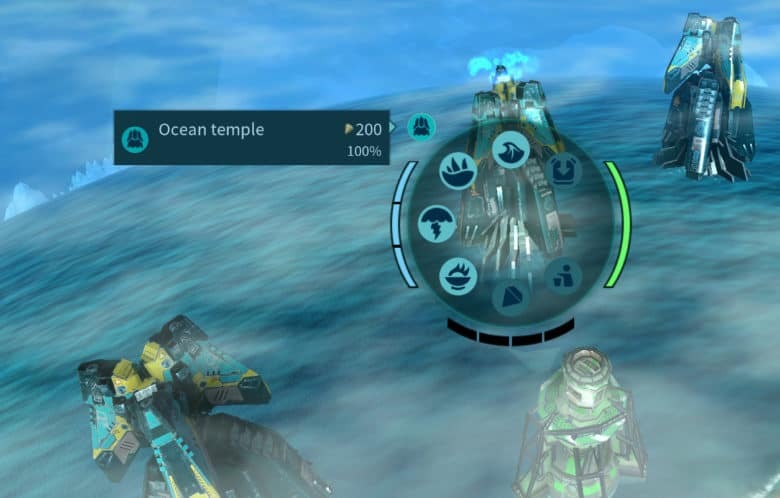 After having introduced the individual factions last update now you can tell the difference between them by looking at their landing ship, which is automatically expanded into the main city tower after landing. 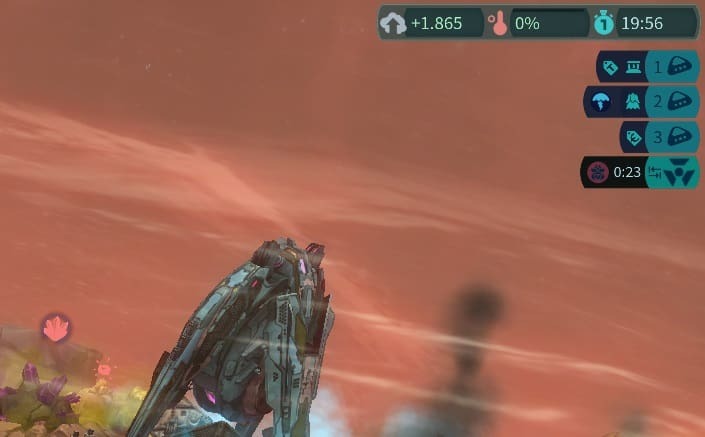 They come around with awesome looking new space ships amazing landing animations ;-). And they are specialized to trade either wares, items and tech, or rare resources. 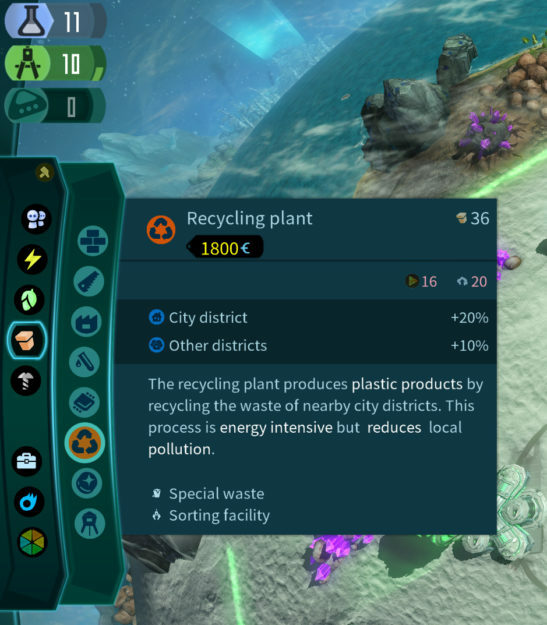 The resource panel has been split into a money and a resources part. This helps to put the four basic resource classes and their storing and trading issues directly into the middle of your attention. 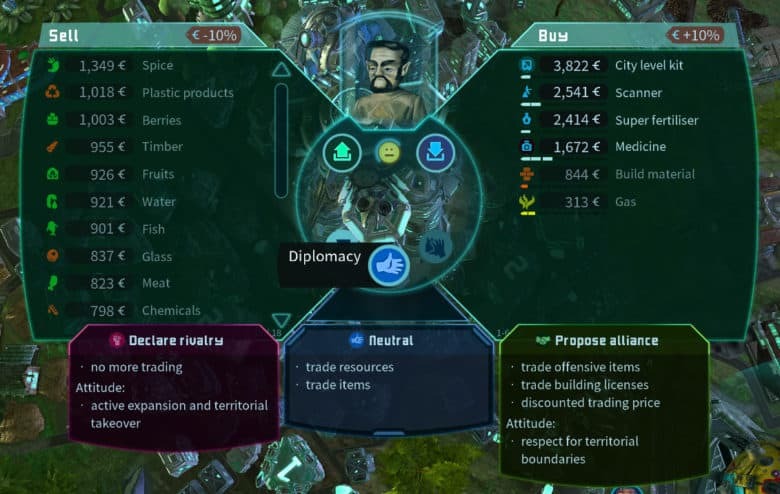 It now also shows you if there is another colony or trader able and willing to sell a certain resource to you when you need it (e.g for crafting). You can also activate the automatic purchase and sale of resources. Note that this involves trading with every potential trading partner – regardless of whether the price is fair or not. The emission levy now always must be payed as soon, as a company on the planet has a negative emission balance. Environmentally friendly corporations get emission trade payouts if there is a company that pays in. The global emission balance is now visualized with positive values when the world’s climate is OK. It’s represented with negative red numbers when climate balance is going bad. Much more intuitive isn’t it? Now you get written info on all construct upgrades left to the tool ring. The field info panel with details on deposits, pollution and other values of a single field is now also visible in navigation mode. The probability of occurrence of riots and epidemics was too low. it has been increased by about 40%. When using the seed bomb or nitro-skirlide seeds you can now see how well the plants will grow in that area. There’s now a countdown for competitors coming down and landing their capsules. This puts you a bit under time pressure to find the best place for the base. You can buy landing permits in missions as soon as you got the second city center. Good news in case a city is burning down. Temples can now be repaired. 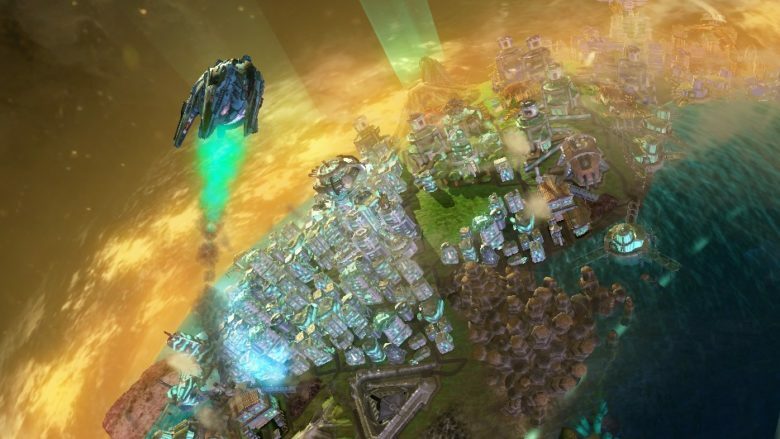 Rewritten – Hypergate Ideon Objective – the vendor states out more clearly have to find and also sell the ideon crystal to him to open hyperspace gate into Udoxia Galaxy. Fixes for Rounos mission: Joe story plot does not wait for clicking the quest icons anymore. Tornado fix – still visible in navigation when multiple tornados in one field. Midras Digger fixed model and particle system. Dust when drilling. Thanks for your attention once again! 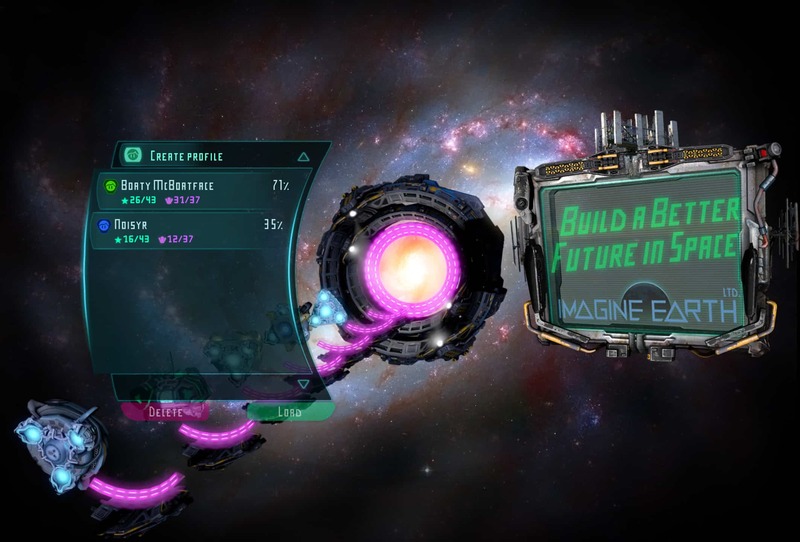 We hope you enjoy playing Imagine Earth and share with us your ideas on development. Wow, this feels like the biggest game system update since ever. It comes with a Simplified Chinese translation ( many thanks to deloquac! ) and so many other changes. 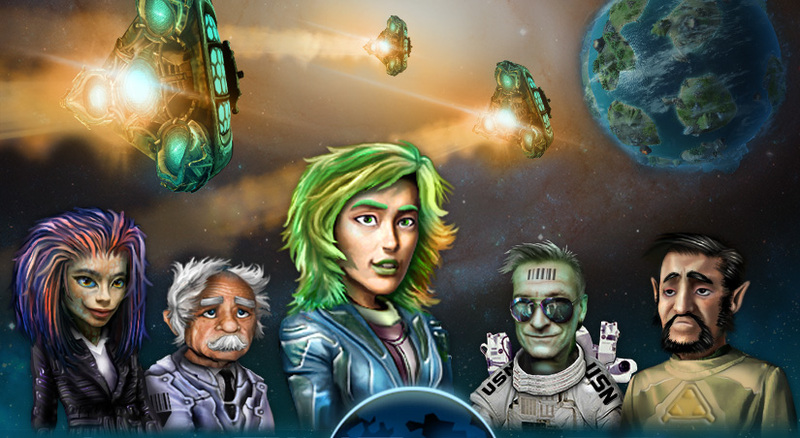 Good timing to invite friends: Imagine Earth is 20% off during the steam summer sale. You can now craft construction kits and landing controls for special buildings like the temple, pyramid, assimilator, Midras digger and the extractor and then place these units where and when ever you need them. 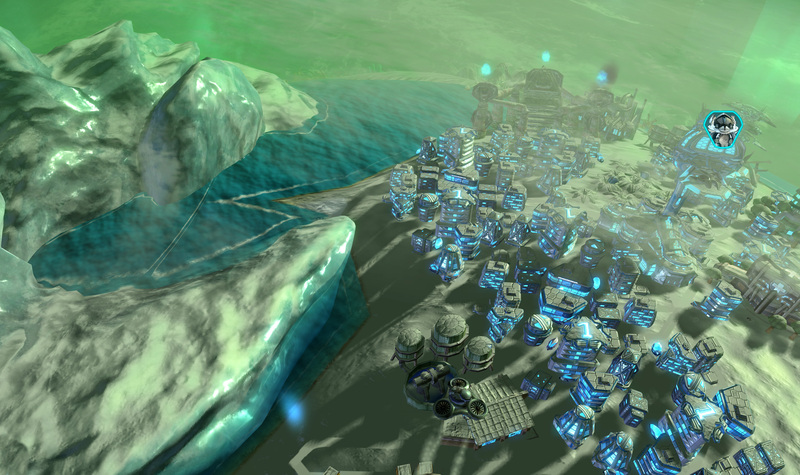 The extractor can only be build on an asteroid of course. 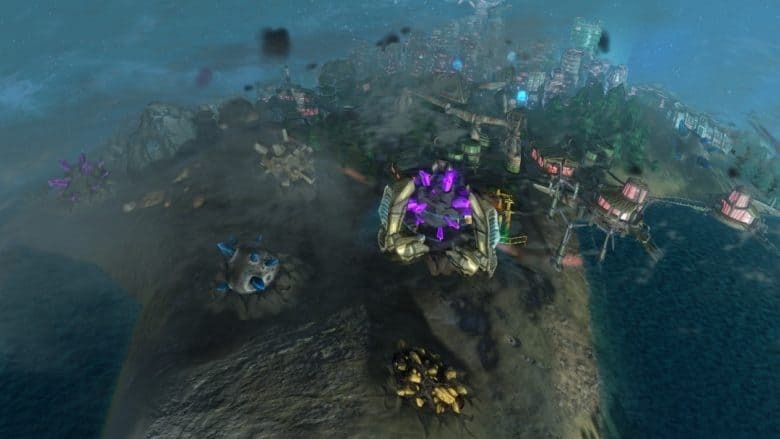 Assimilator and digger can only be build outside the base. In rare cases traders will ship these items. These artifacts are parts of ancient alien technology which enable you to use the Gaian energy force fields of the planet. They are used to craft all the special constructions mentioned above. 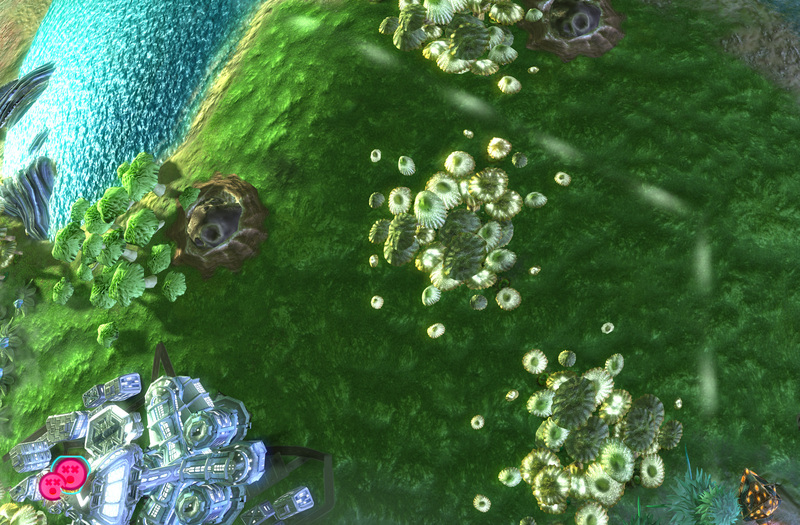 To gain artifacts you can now plunder temple ruins and wracked assimilators using drones. In addition they are produced by natives and can by bought from them (as long as you have a friendly relationship). 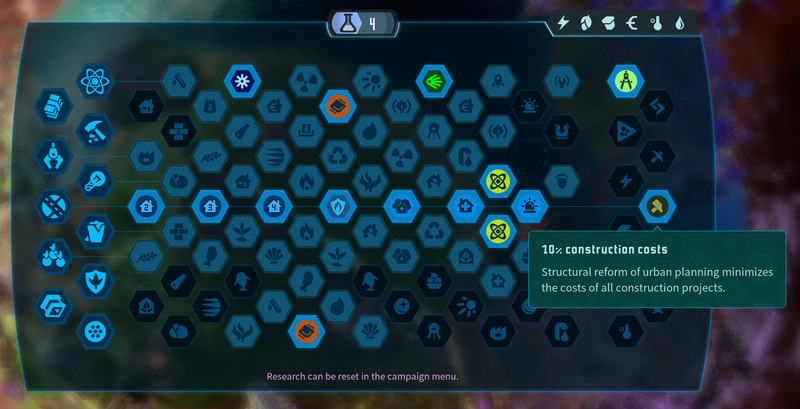 We have thrown the standard tools like claim and clean out of the research panel ( they’re all available by default now ) to make place for eleven new research options. They are very powerful general improvements for your colony management system. Options vary from „-10% construct costs“ or „-20% percent emissions“ to lower consumption of food or goods and so on. Only difficulty: You need to research a whole research sector line to unlock them on the end. 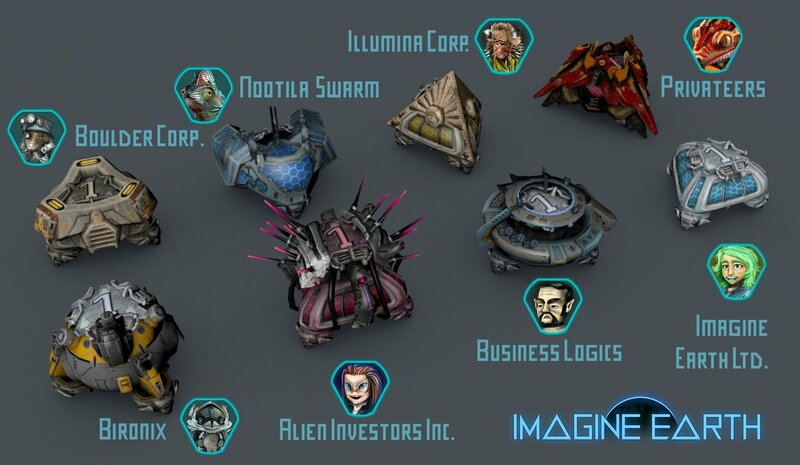 There are now eight different corporations in the game with individual setup of technologies, startup icons and special abilities. In free play and competition mode you can choose one of these parties. 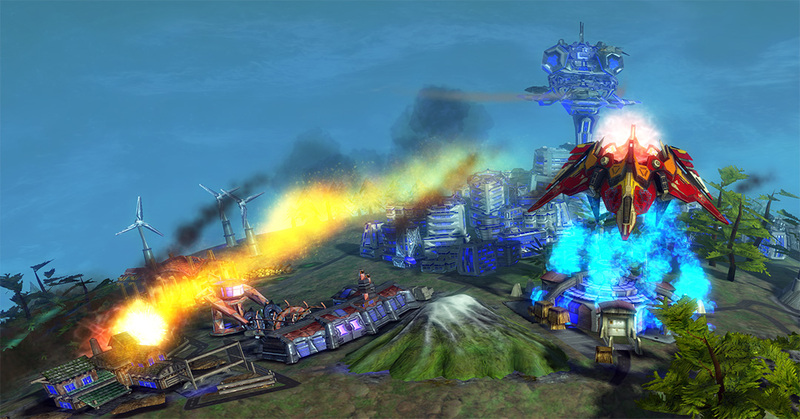 The unlocked technologies of each faction also includes research of the upgrades. So each company has its own preset of research points to start with in the research system. Check out the two totally new factions to get a sense of how their individual possibilities are set up! We are actually still working on this and try to balance the factions. Please tell us what you experience throughout the gameplay .. These corporations come with an individual background story as well which will be reflected in a kind of personal agenda as developments continues. This agenda will define how the company operates when they are you’re AI controlled opponents if you chose them for a colonization match. To get rid of these edgy triangle borders we made the visualization of the borders much more discreet and subtile. Last update we integrated infos about a working construct into its ring so you can understand in detail what influences production and mood. Now we have also added all the general values and information on buildings into the build ring to make the different constructs comparable. In this context the descriptions of all buildings have been revised. There is a global storage system now. The resources will be shared between all your warehouses. Whenever a warehouse gets lost, broken or taken over by an opponent, your precious resources will be shipped to other facilities through an underground tunnel system to ensure nothing gets lost. Each warehouse now also has two slots for energy, food and goods each by default. We have implemented a new approach to the savegame menu as well. 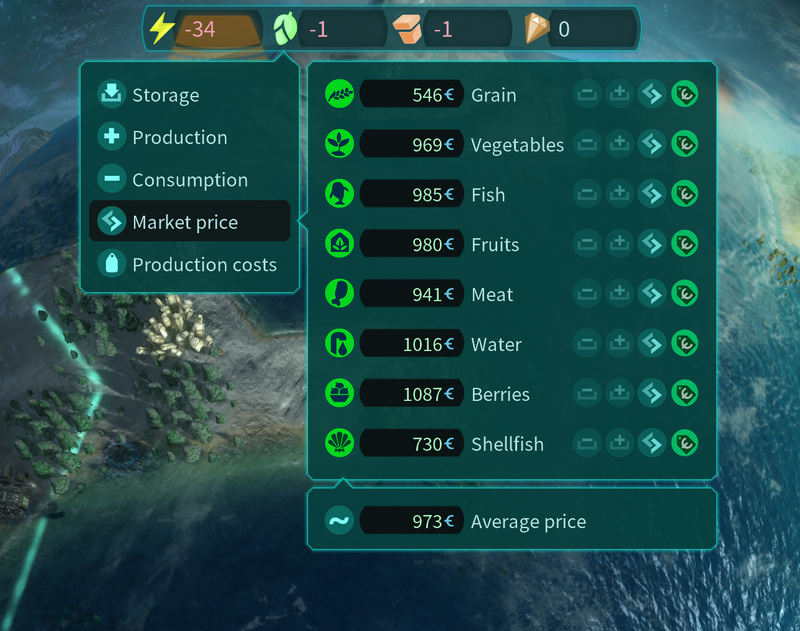 You can now see more structured information and a small close up screenshot to pick the right savegame. Xrathul no longer leave without you doing anything. They no loner harvest rocks and forests and only take very few fossil resources. 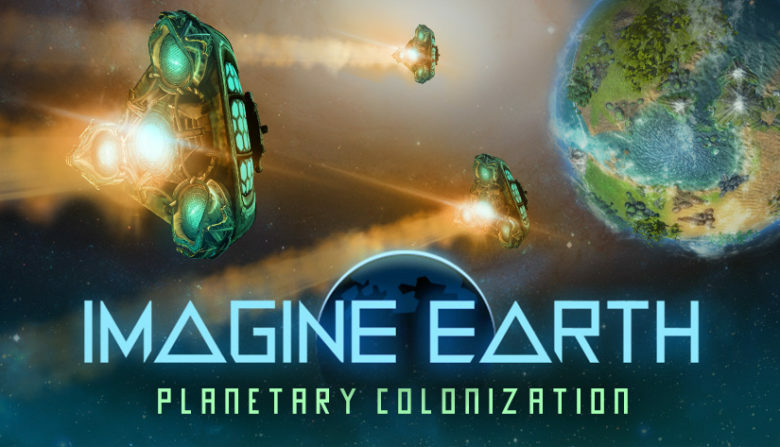 Thanks for your interest in the Imagine Earth Project, tell us what you think about the latest developments or get engaged in any of the games social platforms. For example you can engage in our new Imagine Earth wiki on gamepedia. 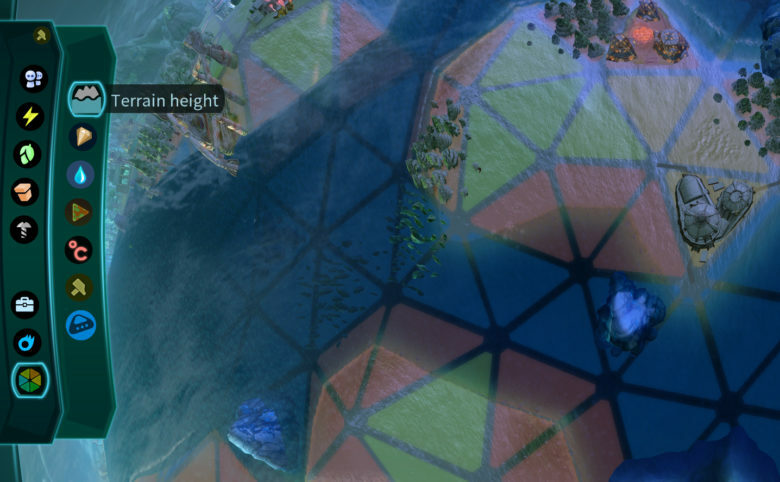 prepare yourselves to build some beautiful ocean districts for your people! 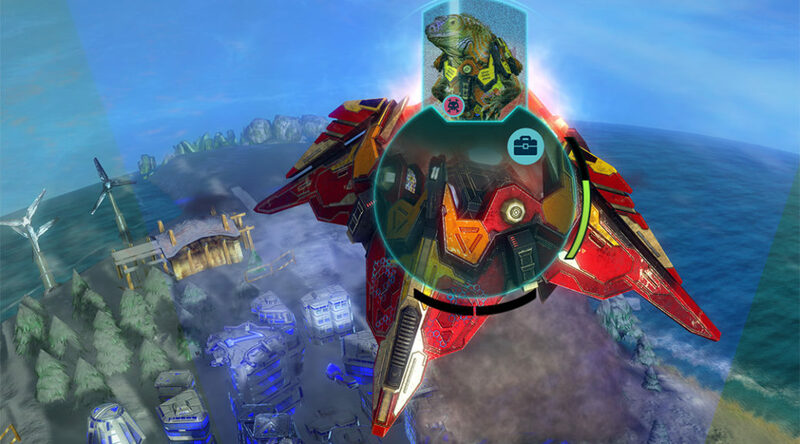 In addition there are loads of detail improvements that give the overall playability a huge boost! Mostly based on testing and your highly appreciated feedback. Special thanks to Johannes for improving our german translation! 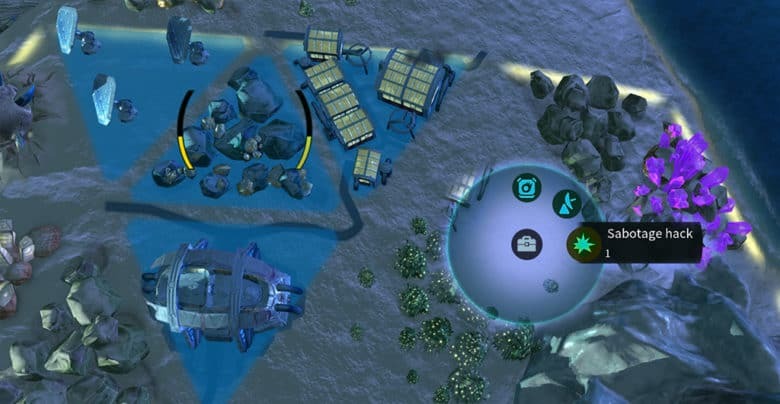 Placing a new colony or frontier building now displays icons on the surrounding fields. The represent the quality of the area by highlighting deserts, fields with high fertility, fossil or rare resources and more. The price of resources and items always depends on who you are trading with. Space merchants and tech traders will charge a fee that makes buying more expensive and selling less lucrative. Natives and midras on the other side don’t know a lot about space market prices and often sell stuff very cheap. Other colonists, finally, link their pricing to your diplomatic relation. This means it can be very powerful to have a good relation towards another company. This new district is now made available in the Lorian mission. 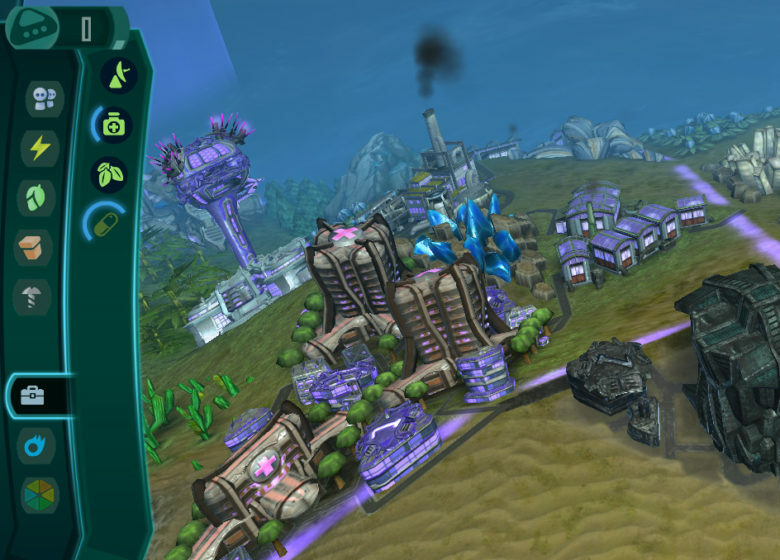 The ocean district can be built on coast fields and the open sea. Districts have to be linked to others who connect with the shore. Microplastic collectors clean the seas and recover goods by filtering floating plastic, other waste and impurities from the water. Ocean thermal energy conversion uses the temperature difference between cooler deep sea and warmer surface water to meet part of the energy demand.